This article is excerpted an article by Crystal Weyers from Seacoast Online. You can see the original article here. The Great Bay is an enormous and underknown estuary near Portsmouth, New Hampshire. 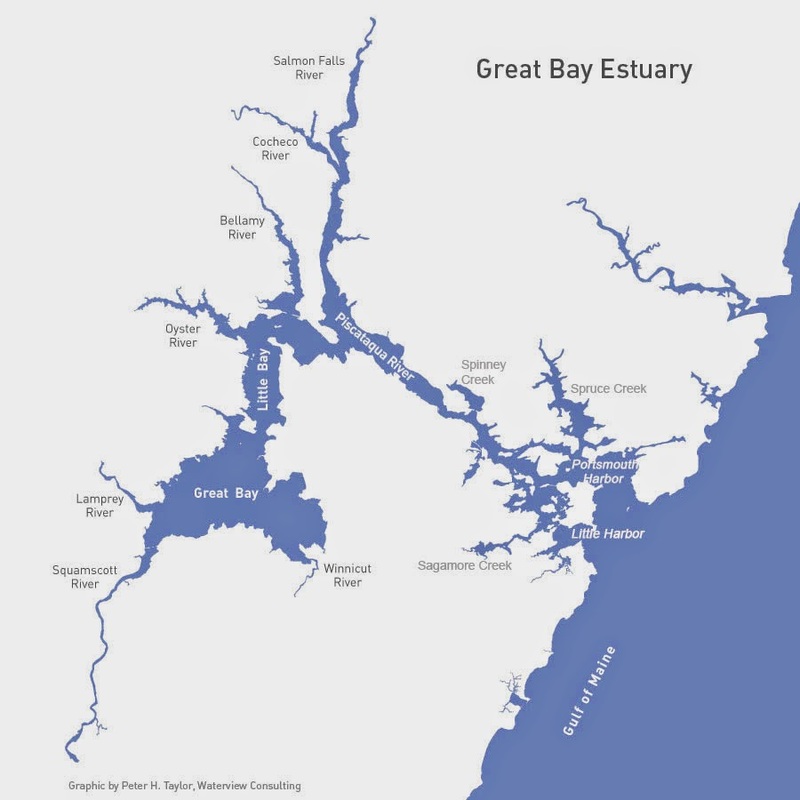 Here is a link to The Great Bay Stewards. PORTSMOUTH — The effort to restore reefs of live oysters to the Great Bay estuary is in it's sixth year and making measurable progress. With 15.5 acres of reef constructed and more than 13 million adult oysters restored to the estuary already, the effort is the largest of its kind north of Chesapeake Bay. This summer's reef restoration, in the bay near Newmarket, was completed Wednesday. O'Brien said the population first collapsed in the 1990s when a waterborne disease made its way up the coast from the southern states. The oysters now being introduced are special disease-resistant oysters raised at a UNH laboratory by Dr. Ray Grizzle. The group is hoping these oysters will grow a more resilient population. The shellfish play an integral role in sustaining the estuary and filtering harmful pollutants out of the water. O'Brien said the creatures offer three benefits: providing a physical reef structure, which acts as a physical barrier in the water column to help prevent erosion; serving as a habitat for many species of fish and eel grass; and filtering nitrogen and other pollutants. “Oysters are water filters,” he said, explaining one oyster can filter as many as 20 gallons of water each day on its own. With Great Bay suffering from increased nitrogen levels, oysters provide a natural solution. “The more oysters, the more filtering of nitrogen they do and the less nitrogen in the water,” O'Brien said, adding the reefs are built near wastewater treatment plants that are already closed off to harvest. It is interesting that New Hampshire has found ways to place oysters in closed waters while those in Massachusetts remain inflexible on this point. Although the group has worked to construct acres of reefs the past several years, O'Brien said the goal is for the oysters and the reefs to eventually become self-sustaining. The reefs are built by laying several hundred tons of dried, recycled surf clam shell to the estuary channel bottom in arranged plots. The shell layer acts as the foundation for the living reefs, which then act as “spawner sanctuaries” for the rest of the estuary. The newest reefs were constructed earlier this week by marine scientists from the Nature Conservancy and UNH alongside local marine contractors Riverside & Pickering and Granite State Minerals. Later this summer, more than a half-million of Grizzle's lab-raised oysters will be placed on the newly constructed reef. The reef will be monitored to measure oyster growth, habitat restoration and overall reef success. Funding for the project comes from federal, state, and private sources. Lead funders include the Piscataqua Region Estuaries Partnership, National Oceanic and Atmospheric Administration Restoration Center, N.H. Department of Environmental Services and many private donors.